Most notably, Ms. Dreyfus is the director of the art house sensation STOLEN a feature documentary about the largest unsolved art heist in American history. STOLEN was released theatrically in more than 50 cities nationwide and was included in the PBS Emmy-Award winning series Independent Lens. STOLEN is currently available on Netflix. Throughout her career, Ms. Dreyfus has expressed a strong interest in arts and culture and recently she created a series of artist portraits, including painter Alexis Rockman and photographers Timothy Greenfield-Sanders, Sylvia Plachy and Gregory Crewdson, for OVATION TV. Her first feature film entitled Bye-Bye Babushka opened to critical acclaim in New York and Los Angeles and has been shown on television in more than twenty-five countries worldwide including PBS in the United States as well as winning numerous festival prizes. The legendary documentarian Albert Maysles deemed it “a formidable first feature” and offered his support. He became the lead cameraman on STOLEN and an important mentor to Ms. Dreyfus. Ms. Dreyfus has received numerous grants and fellowships for her work from such institutions as The New York State Council on the Arts, The Sundance Film Institute, The Jerome Foundation, New York Foundation for the Arts and Women in Film and Video. She is currently developing an original feature script entitled “ISABEL X” as well as the groundbreaking series ON MEDITATION. Ms. Dreyfus is the co-founder/co-owner of SNAPDRAGON FILMS, which creates commercials and works for film and television. Susannah Ludwig was deemed a “visionary independent producer,” by The Sundance Film Institute when they awarded her the prestigious Mark Silverman Fellowship. Most recently, she produced KINGS POINT, which was nominated for an Academy Award and will premiere on HBO in March 2013. Ludwig co-created and executive produced the docu-series BOOMTOWN, about the effects of oil discovery on a small town in North Dakota. BOOMTOWN aired on Discovery/Planet Green; the Associated Press called it “brilliant,” adding “it's impossible not to get swept up in this saga of haves and have-nots, and not to root for them all.” BOOMTOWN was the recipient of the prestigious IDA award for Best Documentary Series in 2011. She has also been a major force in the realization of numerous critically acclaimed theatrical films including OUR SONG, directed by Jim McKay; BALLAD OF RAMBLIN’ JACK, directed by Aiyana Elliott; SPRING FORWARD starring Ned Beatty and Liev Schreiber, directed by Tom Gilroy and LA CIUDAD, directed by David Riker. Ludwig is currently developing a diverse slate of projects, including a narrative project, ISABEL X, directed by Rebecca Dreyfus, a docu-web series, ON MEDITATION, a television series, MAKE ROOM FOR BABY, and two feature documentaries SUNLIGHT MAN, directed by Joel Gardner and INVISIBLE BEAUTY for BET. Ludwig also is the executive producer/co-founder of Snapdragon Films, a full-service production company. She lives in Brooklyn, with her son Jack. 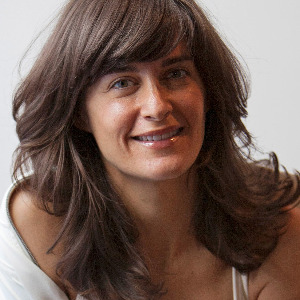 Mama, founder and co-owner of VIRAYOGA, and co-author of Art of Attention, Elena has taught yoga for 16+ years. After graduating from Cornell University in 1992 with a design degree, she worked as a textile and apparel designer for 6 years, then studied with master yoga teachers for over 10 years. Through her teaching, influenced by several traditions including alignment-based Hatha and Kundalini yoga, Elena offers yoga as a way to approach our world with realistic reverence and gratitude. Her classes are a masterful, candid blend of artful alignment and attention cues for your body, mind and heart. From the Museum of Modern Art to the Great Lawn at Central Park, from the playa at Burning Man to the Eiffel Tower, Elena is honored to offer larger-scale experiences of yoga, but her true service is in shifting awareness within the smallest interactions; one family, one household at a time. As a coach with the Handel Group, she coaches individuals and teaches courses, and she’s been featured in the New York Times, Yoga Journal, Element Yoga for Beginners DVDs, ABC News and NBC News. Dozens of yoga practices with Elena can be found on Yogaglo. As the Executive Producer of On Meditation, she is proud to help bring this impactful project to fruition. Garth Stevenson is a Brooklyn-based film composer and double bassist. Raised in the mountains of Western Canada, nature became his primary inspiration and the common thread between his life and music. In the past four years, Garth has released two full-length solo albums, informed by his experiences carrying his 150-year-old double bass to the woods, the beach, and the desert. His most recent and critically acclaimed release, Flying, is a seventy-five minute homage to a recent life-changing trip to Antarctica. Of Flying, iTunes praises, “Garth Stevenson joins the likes of Brian Eno, Sigur Rós, and David Sylvian as a practitioner of this ethereal yet accessible genre… ‘The Southern Sea’ offers the aural equivalent of effortlessly swimming underwater without ever needing to come up for air.” Flying was recently featured on WNYC’s New Sounds radio program along with Ben Frost and Yo-Yo Ma and was featured on the main page of iTunes. Stevenson attended the Berklee College of Music on a full scholarship and received a degree is Performance and Jazz Composition. He has performed throughout Europe, Asia, North America, South America and Antarctica. He has appeared on David Letterman, Craig Fergusson, hundreds of radio stations, at Bonnaroo, and at music festivals in Europe, Japan, Russia, Canada, and South America.